London: The Bank of England will spend £75 billion more of newly-created money to shield Britain’s economy from the euro zone debt crisis and keep a faltering recovery going, opting for an early, dramatic move to maximize the impact. 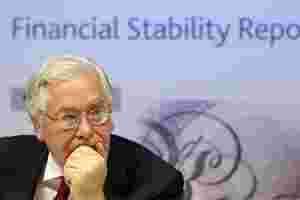 BoE governor Mervyn King said in a letter to finance minister George Osborne that the global economic recovery had slowed, and that the euro debt crisis had created severe strains on financial markets. “These tensions in the world economy threaten the UK recovery," King said. While inflation was still expected to rise above 5% over the next months, the recent deterioration of the outlook had made it more likely inflation would undershoot the 2% target over the medium term. The bold move puts the BoE ahead of other central banks in responding to a darkening global economic outlook and renewed market turmoil. All eyes will now be on the European Central Bank later this session to see if it primes markets for pre-Christmas interest rate cuts. The UK central bank kept interest rates on hold at a record-low 0.5%, while the ECB has raised them twice this year to 1.5%. Analysts in a Reuters poll had reckoned there was a 40% chance the central bank would restart its asset purchase programme, or quantitative easing, this month, though most had only expected an injection of £50 billion. Sterling fell to $1.5280, its lowest since late July 2010, dropping from around $1.5466 before the announcement, to trade with losses of around 1% for the day. UK gilt futures spiked over 100 ticks higher to hit 131.49, before falling back to stand at 130.90. A number of policymakers had flagged their readiness to join arch-dove Adam Posen and vote for more quantitative easing, after many saw the case for more easing strengthening at the September meeting. “The fact that the MPC chose to act now on QE and to go for £75 billion rather than £50 billion reflects the fact that they believe an already difficult outlook for the economy has deteriorated amid mounting domestic and global headwinds," said Global Insight economist Howard Archer. “We suspect that QE will be extended further in the first quarter of 2012," he said. Britain’s economy has basically flatlined over the past 12 months. With the government’s hands tied by its pledge to erase a budget deficit of some 10% of GDP, pressure has been mounting on the bank over the last couple of months to do more to support the economy. The BoE has kept interest rates at 0.5% for more than 2-1/2 years - already its longest period of inaction since World War Two. The BoE had kept its stock of asset purchases at £200 billion since February 2010, when the economy was picking up after a deep recession. But the momentum shifted over the summer from a bias to hike rates to more easing as equity markets slumped and the euro crisis triggered fears of bank collapses and a renewed recession. “We would not be surprised to see the total asset purchase spend rise to £500 billion, with this round of QE starting with today’s £75 billion eventually adding a further £300 billion to the QE1 total," said James Knightley at ING Financial Markets.